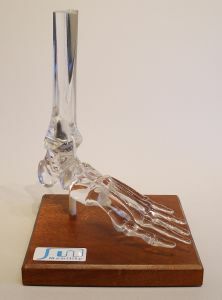 Clear Mobility Total Ankle Model with Replica Implants. The parts list for each model is as follows. The delivery cost is NOT included in the price displayed on this page. It will be calculated automatically and the total cost shown when you purchase by clicking the "checkout" button.Residents outside the EU please note that the price does NOT include any local taxes that may be payable on receipt of the goods.